As of now, we have to copy address received or mentioned in email message on Gmail and paste it on Google Maps to view the exact location on a map. Now you can cut down this routine and directly view location of any address(es) mentioned in email messages on Gmail using “Google Maps previews in mail” labs feature. 1. Login into your Gmail email account. 2. Then goto Settings > Labs tab. 3. 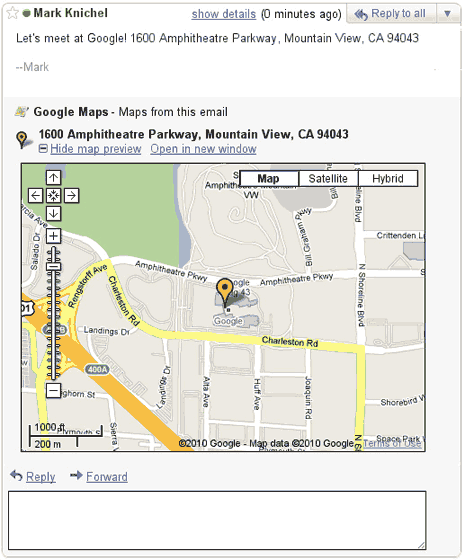 Scroll down and look for “Google Maps previews in mail”, click to select ‘enable’ option and then click ‘Save changes’ button. From now on, any email message containing location or address will automatically show interactive Google Map highlighting specific location. You can hide the map or open in new window directly for detailed view. As pointed by Gmail blog, as of now this feature only works for US addresses and support for all other location addresses will be added soon.